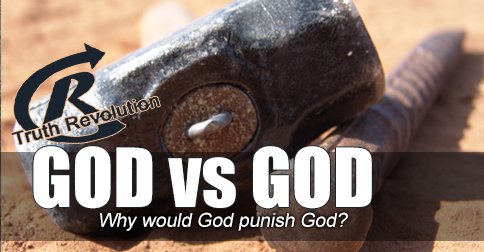 Why would God, the Father, punish God, the Son? [audio:http://www.truthrevolution.tv/show/TS-0323.mp3]No Flash Support? Use this Audio Player! Dave: Sometimes people are confused… why would God punish God for something humans did? Jeff: Right – if Jesus was God, why would God the Father punish him… and how does that magically forgive us? Dave: The reality is, we are forgiven because of God’s vast mercy. Even before the cross, God’s mercy was working. Dave: God is just, meaning he is fair and impartial. He should always punish wrong. Jeff: But he also wants to justify us, meaning he wants to step in and defend us. Dave: So, the way he demonstrated both his justice and his desire to help us was by sending Jesus to die and take our punishment. Jeff: The cross was a demonstration of who God really is! Dave: That doesn’t mean there wasn’t really sacrifice. Jesus paid the ultimate price, and God forgives us through that. Jeff: Yet, that punishment was to demonstrate God’s justice and forgiveness.